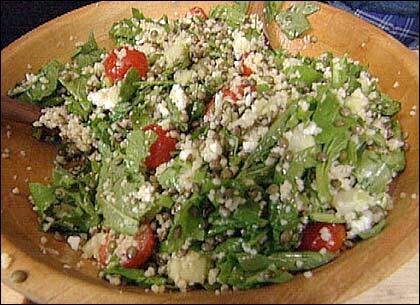 A couscous salad perfect for a picnic or potluck. Place the lentils in a medium saucepan and add enough water to cover by 2 inches. Bring to a boil over high heat. Reduce the heat to medium low and simmer until the lentils are just tender, about 45 minutes. Drain, rinse under cold water, and transfer to a bowl. In the meantime, bring 1 1/4 cups water and the salt to a boil over high heat. Stir in the couscous, remove from the heat, and cover tightly. Let stand until the couscous is tender and has absorbed the water, about 10 minutes. Fluff with a fork and stir into the lentils. Whisk the lemon juice, vinegar, oil, and garlic in a small bowl to combine. Pour over the lentils and couscous and mix well. Add the scallions, arugula, and cherry tomatoes and mix. Season with the salt. Cover and refrigerate until chilled, at least 2 hours and up to 8 hours. Just before serving, mix in the cheese. Serve chilled. Chef Ellen Ecker Ogden notes: There's enough here to feed a crowd, so it is a great dish to take to a potluck or picnic. Vary the greens according to what's available — arugula will add a nice peppery kick and mesclun provides a mellower flavor. This segment appears in show #2914.